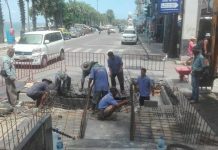 Four months after the Pattaya Mail documented the sorry state of South Pattaya’s Soi Bongkot, things are running much more smoothly. 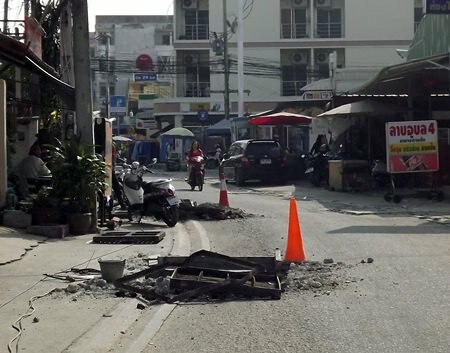 In August, holes of various depths pocked the road’s surface while storm drains protruded from their sockets, causing bumps and crashes for motorbike drivers. In the intervening months, however, road-repair crews have visited the site, resurfacing the 600-meter-long street and replacing the broken drainage covers. Motorbike taxi driver Theerawat Bunsroi, who then called the soi a challenge to drive, especially at night, applauded the upgrade, even though the construction work deprived drivers of customers. “We didn’t have any hard feelings about it because we thought that ‘at least something is being done about it,” he said. Today life is rolling on with the knowledge that, sometimes, city hall can be depended on to fix things.